Common Admission Test 2014 (CAT 2014) aspirants can make amendments in Date of Birth and/or Gender if required on the CAT website from 25th November 10 am on Tuesday, to 28th November 5 pm on Friday. The admit cards for the Common Admission Test 2014 (CAT 2014) hall tickets are available for download at the CAT site from 1 pm on Sunday, October 19, 2014. CAT 2014 is going to be held on Sunday, November 16 and Saturday, November 22, 2014. In case of change of name of a candidate after marriage, candidates are requested to provide relevant documents such as marriage certificate, legal name change, etc for supporting the change in documents. They also have to carry a photocopy of the same at the exam centre. The card include the Candidates’ Name, Test Date and Session Timing as well as Test City and Center Address, amongst other details. Candidates are advised to ensure that their photograph and signature image are legibly printed to make it valid. Students stay tuned to this website we will provide you the link to download. 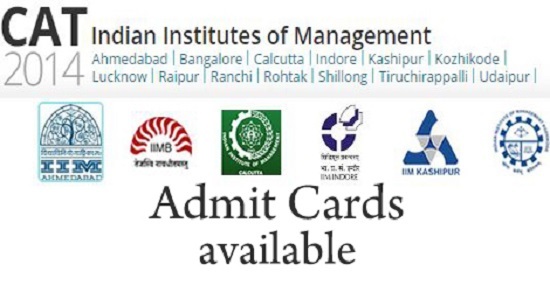 Click on the Admit Card 2014. Fill all required data like name, enrollment etc. Students can check all mentioned information in the admit card like name, roll number, photo, signature etc. They will get any types issued then context with CAT office. Questions in each section have been increased to 50 in each section from the existing 30 questions. Candidates have the flexibility to devote more or less time to each section according to their ability. One can switch over from one section to another section at any point during the examination timing.The tutorial will not be available before the start of the examination and the candidates are advised to do the tutorials from the website well in advance. CAT had released Test Day Video which explained the modifications in the test. The video helped aspirants by clearing their doubts on the additions in the entrance exam. The video covered all important points to be followed by a CAT aspirant on the day of test. The video was launched on October 19, 2014 along with the Admit Cards. Earlier candidates had to login with their CAT 2014 registered ID to view the video, however after the ‘Test Day Video’, candidates can now check the website without logging in.